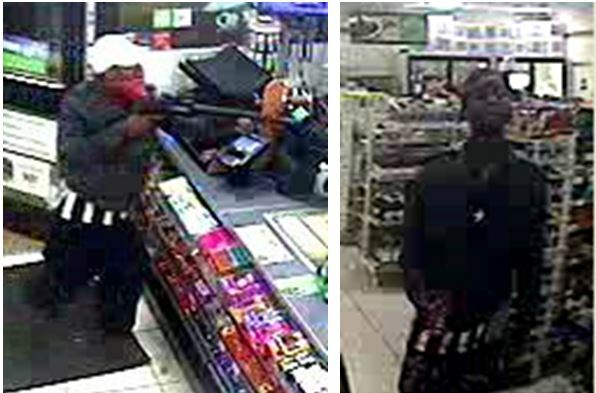 On May 14, 2016, at about 3:20 a.m. the suspect captured in the photo on the left entered the 7-11 store located at 9820 Walnut Street with his face covered with a red bandanna and carrying a pistol grip shotgun. The suspect pointed the shotgun at the employee and demanded cash from the register and cartons of Newport cigarettes. The photo on the right is believed to be the same suspect inside the store with his face uncovered three hours before the robbery. The suspect is described as a black male, 18-25 years old, 5’ 2” – 5’ 4” in height, weighing 130-150 pounds, wearing black pants, a black and white vertically striped shirt, a dark colored jacket, a white baseball cap, and a red bandanna covering his face. The offense is documented on case number 114828-2016. Anyone who recognized this suspect or has information on this robbery is asked to call Detective Carcone at (214) 671-3619. If you wish to remain anonymous you may call Crime Stoppers at (214) 373-TIPS (8477).